Nevron Calendar is a powerful, yet easy to use app for showing and organizing appointments and recurring events. It is a combination between Microsoft Outlook Calendar and Google Calendar functionalities plus many more. Nevron Calendar helps you keep your busy day or company agenda well-scheduled and organized.With Nevron Calendar organizing your time and priorities becomes extremely easy. You can use it online to arrange your events and print or export them in an iCalendar format, or you can use the desktop version on your Windows or Mac device. Nevron Calendar offers you a benefit you can\'t find anywhere else - a calendar that looks and behaves absolutely alike under Windows, Mac and online. Based on innovative technology, it is the only software created simultaneously for all operating systems, thus ensuring all features are 100% identical. 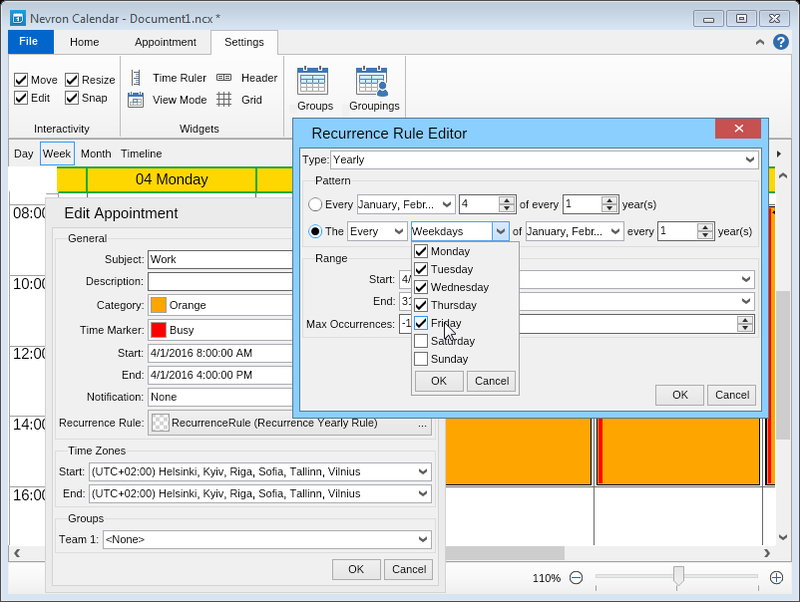 As all the restof the products in the Nevron Office suite, Nevron Calendar comes with a lot of advanced formatting features, allowing you to style your calendar to match your all your preferences.